In the elite world of the academy, there is something vulgar about Frye. He should not be interested in educating but in impressing and controlling the world of ideas. It is hard to imagine any influential critic or theorist saying that “any intelligent nineteen-year-old” should be able to understand what the commanding academic is uttering, even “the elementary principles” thereof. But why shouldn’t an “intelligent nineteen-year-old” be able to understand? Could it be that the writers who preoccupy graduate studies deliberately make their writing opaque or semi-opaque? that this is a cultural imperative of their situation? that, instead of wanting to communicate, their intention is to impress and intimidate, rather than inform? and therefore there is an inherent pressure to dwell on peripheral concerns and pointless or even bizarre trivia? The case for this conclusion is strong. I was once struck by this fact when one of the leading scholars in English studies said more or less this very thing to me in conversation. I mentioned that I tried to write in as clear and direct a way as possible, because I wanted to communicate something and I didn’t want to be misunderstood. The response of this great scholar and critic was: “Not too clearly! You don’t want to write too clearly!” plainly indicating that mystification was part of the function of the academic at the present time . . . It is true that Fredric Jameson argues that clarity of expression is a bourgeois indulgence and an illusion: a peculiar conclusion for a Marxist, when Marx himself writes with stunning clarity combined with a massive scholarship (and, yes, there are difficult passages in Marx). There are many directions to take with this point, but the one that strikes me most forcibly is that Frye had a deep and lifelong interest in education—in education as a technical field, so to speak, not education in the sense of merely accumulating acolytes to spread incense around his reputation. When I say he had a technical interest, I mean that he respected teachers and the teaching profession. He helped in the formation of the Ontario Institute for Studies in Education, for example. His writings on education are voluminous, as the great collection edited by Jean O’Grady and Goldwin French make plain. This body of writing is as profound and valuable as anything he wrote. There is so much in this collection that deserves attention and that is in fact radical and at times scathing in its views of established practices and beliefs. He wrote about education even at the elementary school level, as in his wonderful essay “Elementary Teaching and Elementary Scholarship” (available to read at the above link). This essay has always stood out for me, because I have taught Children’s Literature at university, among many other subjects, and no one who teaches in that area can miss the disdain with which Children’s Literature is viewed by the commanding heights of the academy. Derrida did not write about Alice in Wonderland, though he wrote about almost everything else, from circumcision to apartheid. Frye, by contrast, was interested in Children’s Literature and frequently refers to it, even in Anatomy of Criticism itself, where he presents significant observations about Alice in Wonderland (a favourite of Frye, as of so many intellectuals), The Jungle Book, The Thirteen Clocks, The Water-Babies, and Tom Sawyer (elsewhere other Children’s books, including At the Back of the North Wind). He was interested in children, even though he didn’t have any of his own. He was interested in children’s education; he even prepared a high school English curriculum, and worked for years on texts and editions intended for student use. He explicitly preferred the undergraduate library. Perhaps most telling, he preferred teaching undergraduates. I often think of his remark about teaching graduate students in the United States, that the “echo of their horrid articulateness echoes in my ear to this day” (possibly misquoted). 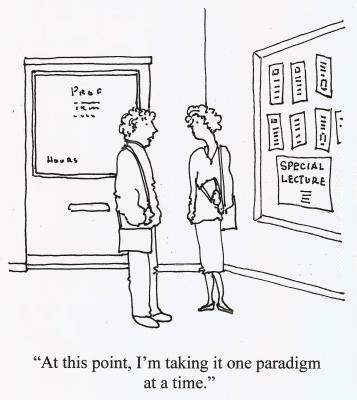 What an unusual pattern in the scholarly world! In academia, scholars are normally preoccupied with the prestigious aim of teaching less and less—of limiting the teaching that they do to graduate students, who will be the bearers of their personal influence. What does this pattern say about Frye? One thing it definitely says is that Frye wanted to communicate. He had a passionate wish to reach people, not just specialized students in specialized schools, but society at large. This is one reason why Frye is so often referred to now by intellectuals outside of English, not by English professors, who believe that Frye is unspeakably unfashionable, like long hair or bell-bottoms or granny glasses. But Frye remains a living presence with many people, from Margaret Atwood to John Ralston Saul to Bill Moyers. If you want to communicate, you are going to do your utmost to express your ideas as clearly as possible. You are going to be unusually conscious of the basic patterns or shape of your thought, and Frye was definitely unusual in his preoccupation with the big picture (as well as studying the tiny details that reveal more than mere details are thought to). He was unusually aware of the basic assumptions he was working with, and did his best to communicate what those assumptions were. This did not prevent Frye from being misunderstood. On the contrary, his attempt to communicate notwithstanding, he was constantly attacked for saying things he did not say. One has only to look at Robert Denham’s compilation of reviews of Frye’s books to see that Frye was never that popular with academics, who seemed to sense that Frye did not belong to their particular caste. Students responded avidly, but colleagues did not. Frye was never a bandwagon, despite his brief but intense period of influence, accompanied and followed by years of misrepresentation and incessant belittlement. Is it ironic, given this misrepresentation and hostility, that Frye wanted so deeply to communicate? Communication mattered to Frye, because he was interested in education, and this interest had an evangelizing dimension. “Communication” meant “community” to Frye. He wanted to stimulate interest in literature, not just study it. Education in turn was much bigger to him than knowing more about writers who have been dead a long time. It was about renewing and transforming society. It was about liberation. Yes, Bob, a good example of the Emperor-has-no-clothes archetype.